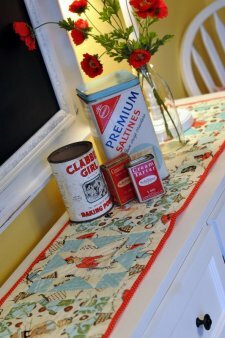 Put a flair of nostalgia in your next table runner project with this wonderful tutorial by Jodi Nelson of Pleasant Home. 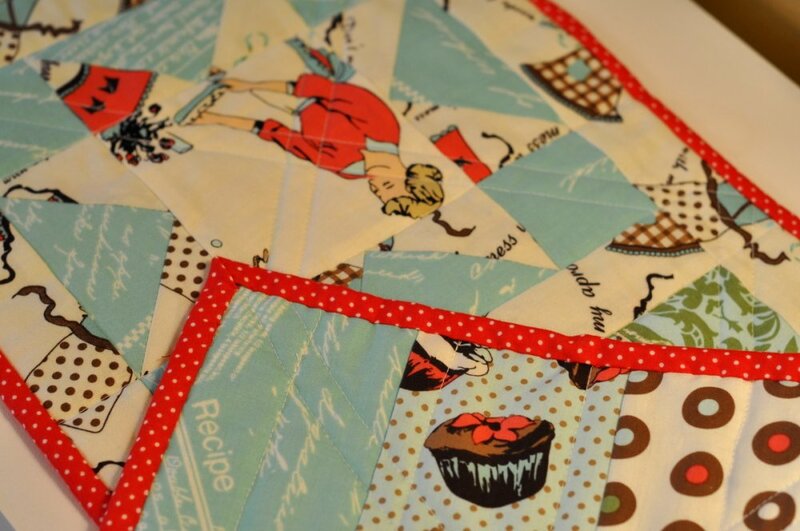 Jodi uses a star block to feature pictorial squares with a vintage Domestic Diva in her version, and while that specific fabric may have come and gone already, there are always more to choose from to achieve a similar look and feel. So whether you're an internet fabric-hunting wiz who can search obscure websites for whatever fabric you need or whether you plunder the bargain bins of your local fabric stores, it may still be possible to find this same fabric, but it is no longer widely available. Perhaps you have an idea for a fabric that is available now that would be good for this table runner? If you do, or if you would like to see ideas offered by others, please pitch in a comment below! Be sure to check out the wonderful Projects she's done (great inspiration!) and Tutorials Jodi offers on her site! There is something for everyone there!